Freedom Music, in collaboration with Playground and No Name agencies, is aiming to coordinate an outstanding line-up of incredible artists for a series of six mini music festivals that are surely going to blow your minds and have you moving and grooving all day long. Hold your breath and get on board: it’s time for Freedom Music’s Sound of London! The event starts at 2 pm, March the 22nd, and will run until midnight. 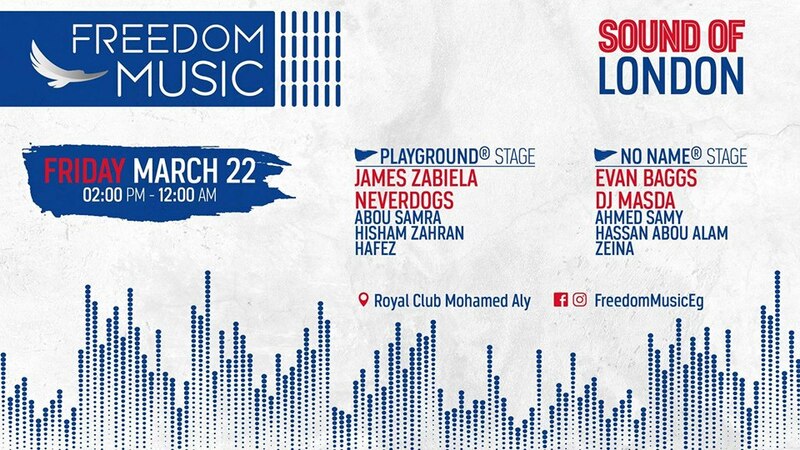 This hot ticket of an event will take place at Royal Club Mohamed-Aly, and as such, attendees will bear witness to the serine beauty of the Nile, while listening to all the amazing artists! We’re here to give you a glimpse of what you’re going to experience on the night: Play Ground’s Stage will feature James Zabiela, NEVERDOGS, Abou Samra, Hisham Zahran, and Hafez. On the other hand, No Name’s Stage is serving up Evan Baggs, DJ Masda, Ahmed Samy, Hassam Abou Alam, and Zeina. Did we mention that the event also promises party-goers fresh sunny weather, full bar services (courtesy of Revel Hospitality), and a food court? Before you book your ticket, please be mindful of the event’s rules; all attendees must be 21 and over, official IDs will be checked at the doors, and the doors will close at 6 pm sharp! Hit the Facebook event page for more details. Now that you know the rules, hurry up and buy your ticket now through Qube. For further inquiries call 01140270861. So there you go folks, a quick intro to the first night with five more incredible gigs to come!